Okay, so I love this series featuring forensic accountant Ava Lee. Ava Lee lives in Toronto and collects debts for a living. This involves lots of travel, bags of stamina, and oodles of personality. But I must admit Ms. Lee shocked me with her ruthless intent on this one. She actually commanded a henchman to proceed with a gruesome threat she'd made to...a ruthless con man. That cool distance in her calculation had always made her seem scary and thrilling but when one actually witnesses her threat made real, it is far less appealing and far more lethal. Now that she has drawn blood, we find ourselves as readers firming up, standing back, calculating, cautious. No longer just lighthearted fun, this makes us ask ourselves what we would have done, or what we would have had our character do. We have to justify following her avenging course. The impingement on our moral sense carries throughout the book, and I find myself distancing myself from her. I read this series out of order, so I still had a glib, happy-go-lucky feeling reading book #3, The The Wild Beasts of Wuhan. I would have to reasses my take on that book in light of this one. In this, an online gambling concern manages to tweak the system so that the owners of the site can view competitors cards and win money illegally. One of the losers happens to have a rich uncle who hires Ava to get his money back. So far, all of the books in this series have more than held my interest--I am intrigued with the legal and moral complications of forensic accounting. It is difficult to imagine someone admitting to being in the leadership of an organization that allowed, with or without intervention, the major atrocities of the last decade of the 20th century. I may be a person who would have gone home spent and embittered with the taste of iron on my tongue. But Kofi Annan did not walk away, nor did he turn his eyes from the terrible events his leadership at the helm of the United Nations was unable to prevent. He does try to explain how it happened that the world stood by while Rwanda ran with blood. Kofi Annan became head of the Department of Peacekeeping Operations in the U.N. in March of 1993 and received the rank of under-secretary-general. The Battle of Mogadishu, also known to Americans as “Black Hawk Down,” took place on October 3rd and 4th, 1993. It was in the immediate aftermath of that devastating event that Force Commander Romeo Dallaire in Kigali, Rwanda sent an urgent request in early 1994 to raid the arms cache of the ruling Hutu political party, having received intelligence that the group was considering exterminating Tutsis, including killing Belgian U.N. peacekeepers in an effort to force a pull out. No government was willing to sacrifice domestic troops to “messy entanglements in a civil war.” So Dallaire was ordered to stand down. This personal history is readable. There are times in our lives when we follow world events with half an eye. With the disintegration of newspaper coverage in recent years and the change in news delivery to online blurbs, radio, or TV newscasters, all using the same quotes from leaders and spinning them as they will, it is difficult to get a real grasp of how diplomacy works, or if it does at all. Annan won the Nobel Peace Prize in 2001, and what a bitter irony it must have seemed to him then. 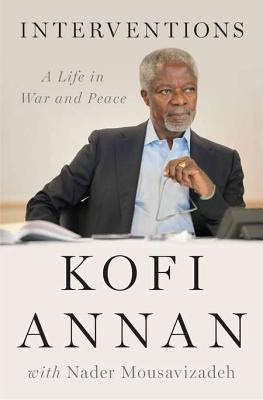 At his acceptance speech in December 2001, he observed that the world had entered the third millennium “through a gate of fire.” But what I was able to understand from this book is why Annan won the Peace Prize in the first place. He outlines the changes he had proposed to the goals of the U.N. and was able to usher in those changes to a great extent, despite using an imperfect and frustrating organization with competing interests among the players. As the Nobel committee commented at the time: the U.N. redefined sovereignty as a responsibility as much as a right and that sovereignty cannot be a shield behind which member states conceal their violations. At the end of the book, Annan discusses the decisions which brought war to Iraq. As a diplomat, Annan felt the decision to go to war was a failure on the part of the U.S. leadership which brought only shame, death, and destruction in its wake. He addresses the Oil-for-Food Programme which became a painful reminder that greed and self-interest often parades as generosity when countries seek their own interests at the expense of another. What we should give him credit for is that, despite the outrageous challenges an international body faces in light of bruising collisions between member states, such a man would spend his time struggling for gains that make a difference to the poorest and most disenfranchised among us. Hallinan has a series featuring Poke Rafferty, an Anglo-Asian male living in Bangkok. In Hallinan’s hands, Bangkok becomes an international center of intrigue focused on its restive Muslim south and juggling its overheated, overaged male spy population who had happily retired themselves only to be called back into harness. More importantly, Hallinan has created his most interesting and powerful female character yet, Ming Li. Ming Li is the Anglo-Chinese step-sister of Poke and she aids his latest attempt to uncover a psychopath bent on destroying those who know his shadowy past. Young, (female), smart, (vulnerable), and irreverent, Ming Li blasts through accepted modes of spycraft to intuit actions of the players in advance. She does not spare her brother who, as a member of the male ruling class, had no need to learn lessons of body language and intent early on. What I loved: 1) Poke Rafferty’s humanity. When attacked by a man with a gun, he manages to save his attacker before rushing off to save himself. Fearful as Poke might have been, he was a good man first. Rafferty is willing to believe the best of people he suspects, reserves judgment on their behalf, and stretches to preserve their basic dignity despite their iniquities—not including the really bad man who deserved everything coming to him. 2) Ming Li. Where Rafferty sees ambiguity, Ming Li cuts through the dross with a rapier mind and lays flat broad swathes of bad folk. 3) The way the author ratchets up the tension by having a long-winded Russian collaborator slow the action with pages-long detail at a critical moment when Rafferty (and readers!) just want the facts. It’s a gentle, funny way to tense us up and preserve forward momentum. Hallinan did very well in raising the temperature of this thriller, but he didn't succeed without flaw: I disliked what I saw as the artificial character of “Treasure” when I first met her. Later, I realized how entirely possible it was to have such a character, neglected, abused, and exploited, when a psychopath is in charge. But the psychopath and the daughter felt like weak links. And herein lie my only quibble: I would have preferred, were it at all possible, to have a bad man with more ambiguity, depth, and moral equivocation than our bad man here. He was so dark, he seemed like a caricature, and made everyone else a little like a caricature also. I believe the general outline of these characters and places are quite the real thing, with only a few of their sketch lines missing. But you know what? It would have been a completely different book had Hallinan made it difficult for us with moral ambiguity. One could even argue the bad man wasn't as bad as he made out, since he did something uncharacteristic for his nature at the end of the book, one assumes because he was a father after all. And after the big event in the final pages, only one body was found instead of two, so one of the two that were "taken out" will be back, I fear. Which will it be? I like Hallinan’s books very much, and when one needs a dose of the heat and flavour of Southeast Asia, or of Thailand's wonderful, complicated "anything goes" acceptance, I recommend having your moral compass realigned by reading a couple of Hallinan's books. Onward [Buddhist] soldier…and tell us more tales. This is the best of the Stanley mysteries I have read: they just keep getting better. Set in a Botswana that we have become familiar with through the Alexander McCall-Smith series THE NO. 1 LADIES’ DETECTIVE AGENCY, this mystery has the same gentle feel of McCall-Smith’s. The big, lumbering detective Kubu is not a hardnose, but he gets the job done with compassion and consideration, though he nearly bites the biscuit himself in this installation. The Kalahari landscape is desert and brutally hot--the territory belongs to the Bushmen traditionally. The Bushmen are as exploited and pushed-around as they are admired and feared. They have a central place in this mystery for their tracking skills, survival skills, and talent with poison arrows. Kudos, the Michael Stanley detective team and HarperCollins for getting the formula right for books that will attract a readership and keep the forces of evil at bay!